By Jennifer Salvato Doktorski ~ Love.Life.Read. Reviewed from: eARC from Simon Pulse—thank you so much! This is from a debut author, Ms. Doktroski, and she is a fresh face in contemporary fiction. I really enjoyed How My Summer Went Up in Flames. Let’s face it—we all make some mistakes when we are teens. How many of us have not done something we felt foolish over or wish we hadn’t done? Ms. Doktroski’s book introduces us to Rosie just after her school year ended. She is devastated that her boyfriend cheater on her and goes a bit crazy. I mean, how many of us destroyed things that our ex-boyfriend gave us…maybe just not to the extent Rosie did though. Rosie is a great character that I think many teens can relate to in some way shape or form. She is self conscious about her curvy figure, her not feeling as smart as her companions on the road trip but she has a great heart and is protective of those she considers friends. There are moments in the book that Rosie made me laugh and, of course, smile through her antics. Throughout the car trip as the miles go by, Rosie begins to see through her actions that lead to her TRO (temporary restraining order) and she begins to grow. She does not have everything figured out when she gets home, nor should she but she is on a better path than she was heading down prior to the trip. The rest of the cast of characters are intriguing in their own various ways. Logan is using the car trip to get Spencer away from their father and a real vacation for the first time in years. He is intensely smart and is gorgeous too boot. Matty is Rosie’s neighbor who is more like a brother and a boyfriend. Matty is such a great friend and we would all be better people if we had him for a friend. Spencer is one of the good guys—those that girls typically overlook. He is passionate about his music and is brainy, a planner and an organizer. Lastly, there is Avery—Logan’s friend that instantly bonds and connects with Rosie after stopping at her house along the way. It is through Avery’s interactions that we see Rosie begin to think beyond the past and now and to begin to think of her future. What I truly appreciated about this book is the characters feel completely believable to me. The story is engaging with laugh out loud moments but some seriousness filtered in throughout it. 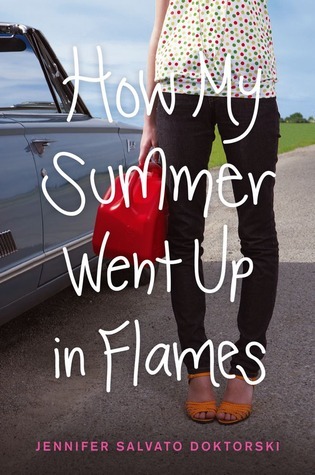 Ms. Doktorski’s writing is fresh and attention grabbing—all important things in writing young adult novels. I am hoping to see her stick around for a long, long time and she could easily become a household name in young adult contemporary fiction. Road trips are such a wonderful setting for books! :) Great point about the parents--they are there and responsive to Rosie. It is true that often times parents are MIA. Thanks for stopping by and Happy Reading! Top Ten Tuesday: REWIND Day!